California’s largest lake was originally created by accident, grew to be a popular fishing destination and wildlife refuge, and today is on the verge of becoming an environmental and public health disaster. Due south of Coachella Valley, and roughly north of the heavily agricultural Imperial Valley, the Salton Sea is the lowest part of a basin by the same name that comprises over 8,000 square miles of southern California and northern Mexico. So large, the lake straddles both Imperial and Riverside counties. Notably, the Colorado River is its neighbor to the east and southeast as it flows toward the Gulf of California. As its neighbors the Chocolate and Orocopia Mountains on its northeast and the Santa Rosa Mountains on its northwest grew and pulled the mantle out from under the valley floor, the depression which became the Salton Sea subsided until it reached its current position, which at its lowest point is 278 feet below sea level. Actually a part of the Colorado River delta, over time, silt carried by the Colorado toward the Pacific Ocean built up along the southern and eastern edges of the Salton Basin, creating the levees the border it. Nonetheless, a few times in its history, the Colorado changed course and moved westward, flooding parts of the basin and forming freshwater lakes, each known as Lake Cahuilla. Eventually, the river returned to its natural channel, and without new water coming in, evaporation in the arid environment dried up the lakes. Beginning in 1900, to help irrigate fertile but dry lands in the Imperial Valley, canals were built across the southern edge of the Salton Basin. Too small to handle flood waters and shoddily built, in 1905 after heavy rainfall and snowmelt, massive amounts of water pouring into one canal from the Colorado River overran two dykes and broke the canal’s headworks. Over the next 18 months, despite efforts to stop it, water from the Colorado flowed freely into the massive basin, creating two new rivers, the New and the Alamo, and a freshwater lake, the Salton Sea. Flooding from the Colorado was stopped in 1907, but not before the water had submerged the town of Salton, as well as land owned by the Torres Martinez Desert Cahuilla tribe. 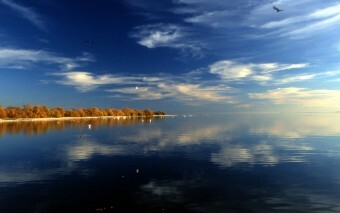 At this time, the Salton Sea’s surface sat at 195 feet below sea level. If left to natural processes, the Sea would likely have dried up long ago. Evaporation in the area occurs at the rate of nearly 71 inches per year, while annual participation is just over 2 inches. However, seeing the need for a safe place to deposit agricultural wastewater, particularly from the Imperial Valley, in 1928 Congress designated all land below 220 feet in the Salton Basin as a repository for the runoff. At that time, after 20 years of evaporation, the surface of the lake had dropped to about 250 feet below sea level, but after agricultural runoff flowed in, it rose again to 227 feet below sea level. Today, its average depth is about 30 feet. Although many fish species migrated to the Salton Sea during the 1905-1907 flooding, evaporation and agricultural runoff (which is laden with sodium and chloride) made the waters too salty to maintain a healthy ecosystem. In the 1950s, the state of California stocked the Salton Sea with more salt-tolerant fish, including corvina, sargo and bairdella, and anglers flocked to the lake. The fish also attracted migratory birds, and the Salton Sea eventually became a stopping point on the Pacific Flyway. By the 1960s, resorts, marinas and yacht clubs littered the shores of the Salton Sea. Following the earlier pattern, the chemicals, nitrogen, fertilizers and salts from agricultural and industrial runoff again overpowered the fragile ecosystem of the Salton Sea, and large fish and bird die offs began to occur. In fact, in 1999, an algae bloom of such magnitude happened that over 7 million Tilapia died from lack of oxygen (their corpses littered some parts of the Salton Sea for the next decade). Over the last 15 years, conditions have only worsened. In 2005, salinity levels in the Salton Sea had exceeded that of the ocean by 30% and reached 45,000 parts per million, the point at which at least one of the Sea’s fish species, corvina, will no longer spawn. In addition to this environmental disaster, many are also concerned that once the Sea completely dries up, it will generate tons of harmful dust that will pose a public health threat and devastate the local economy. Can the Sea be saved? 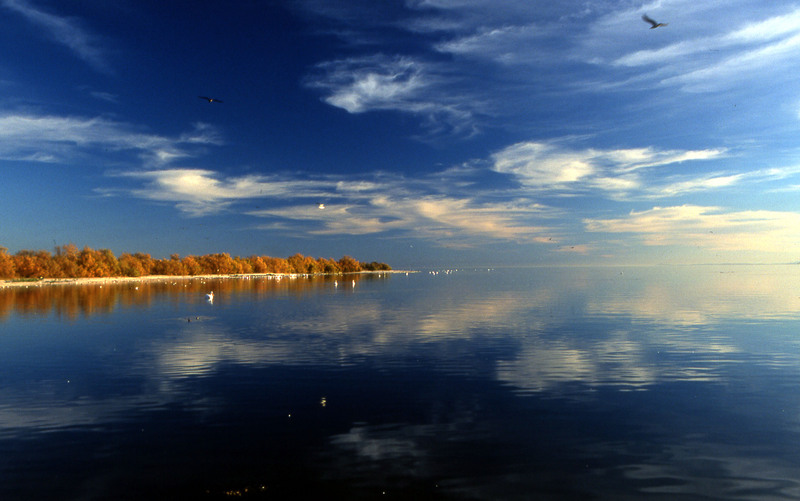 In 1993, California formed the Salton Sea Authority to oversee preservation and use of the lake. With two representatives each from Imperial and Riverside Counties, the Imperial Irrigation District, the Coachella Valley Water District and the Torres Martinez Desert Cahuilla tribe, the authority has worked for the past 20 years to develop a viable plan. In the meantime, the situation in the Salton Sea is set to become even more critical. In 2017, a key water settlement agreement will expire, after which much of the runoff from the Imperial Valley will be diverted from the Salton Sea to San Diego and towns in the Coachella Valley. To address the basin’s problems, California has already begun planning a pilot effort, the SCH Project, which will provide clean and safe habitat for fish and birds and includes deep-water pools, loafing islands and integrated sedimentation basins. Local authorities are also working on other projects, including the Imperial Irrigation District, which is focusing on shallow-water habitats. State and federal money has also been earmarked to help with these efforts, including $2 million from California to conduct a feasibility study of other projects, and a request from the Obama Administration for an additional $200,000 for the Army Corps of Engineers to provide assistance. Very cool could you give me more articles about lakes accidentally created?